The year was 2007. Newly married, I decided to host the Vu clan at my house. 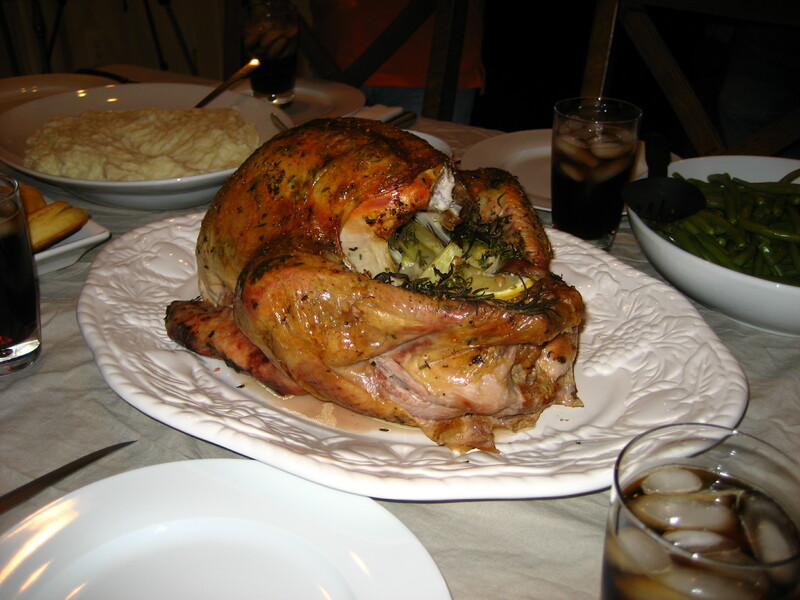 I was very excited to impress my family with my homemaking skills and to finally have a “real” Thanksgiving. One not tainted by the Vietnamese tweaks and side dishes, just a traditional turkey with mashed potatoes, green beans, stuffing, flaky biscuits, corn, and sweet potatoes. And just as if it were straight out of a Martha Stewart magazine my turkey came out beautifully golden and the gravy from scratch was just divine. That elation was short-lived when I noticed a small mound of gunk near the head end of the turkey. Let’s step back a little bit. In prepping the turkey I gingerly probed for the sack of turkey neck and gizzards. I swear I triple checked the innards and bravely explored the cavity on the second and third go in search of that sack of turkey parts. No dice. I guess the companies don’t include the turkey parts that no one really uses anyways I thought. Nope I was wrong, the sack of innards was neatly tucked underneath near where the neck would have been with the skin folded over it. I can’t make this kind of stuff up folks. In the end, the turkey was still delicious (although slightly undercooked here and there), my parents were still disappointed with the lack of rice, we gave thanks, and had a great family meal. This year will be the second time I host Thanksgiving. And guess what, it’s going to be a Vietnamese Thanksgiving with no mashed potatoes in sight. Why post this now and not on Thanksgiving? Because Thanksgiving will be a day of thanks and delicious food and is really not the time to call to mind the image of a hot sack of oozing innards being plucked from my almost-perfect turkey. Moral of the story, check every flippin crevice of that fowl and make sure you remove that sack of guts before you roast it. Gobble gobble! I almost did that last week. Checked inside (from the rear), and all I saw were ribs and nothingness. When I put it on the roaster, I caught a glimpse of some white plastic coming out the front. I think the turkey people are messing with us. Enjoy your thanksgiving! I have forgotten that bag inside the turkey so many times! They need to make a top 10 list of the most comment Thanksgiving meal mistakes. I think that one will be on it. Haha! Glad you guys survived it! Happy Thanksgiving!! !